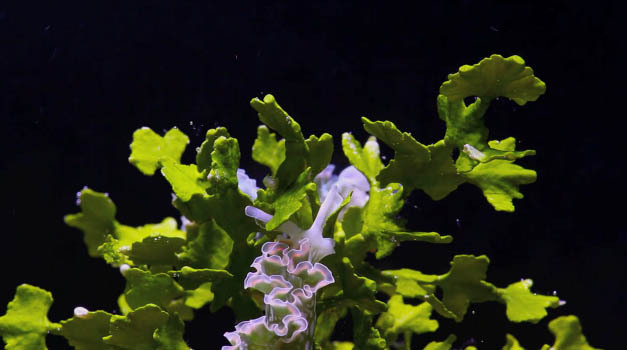 This Lettuce Sea Slug video from Morphologic Studios is one of our favorites. This colorful species is often mistakingly confused with a nudibranch. The Lettuce Sea Slug requires an ample amount of live rock on which it can forage for algae. Additionally, the Elysia crispata integrates chloroplasts from the algae into it’s own tissue, and therefore it obtains part of it’s energy from photosynthesis. This slug can easily get sucked into a powerhead, so please take care to cover pump intakes if you house one. Lettuce sea slugs (Elysia crispata) are a commonly found in protected nearshore Floridian waters where green macroalgae proliferates. They belong to a clan of sea slugs, the sarcoglossans, that are characterized by their ‘sap-sucking’ feeding habits of algae. These slugs slowly patrol mangrove roots and rocks searching for green algae upon which they feed. They store some of the chloroplasts from eaten algae in their tissue, giving it the green coloration. The chloroplasts continue to function, providing the slug with photosynthetic energy. The ruffles along the back of the lettuce sea slug are called parapodia, and help provide more surface area for the chloroplasts to inhabit. They also camouflage the slug amongst the leafy algae that they live amongst. It is very easy to swim past a lettuce nudibranch without ever noticing it.